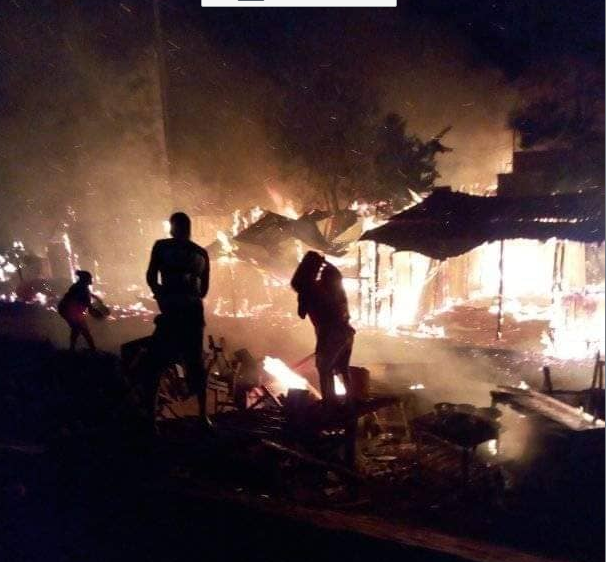 AMURU – Several traders operating in Elegu, a border town between Ugandan and South Sudan in Amuru District, are counting losses after fire gutted their shops in the wee hours of Monday morning. According to Jimmy Patrick Okema, the Aswa Region Police spokesperson, the fire, which razed down shops, clinics, saloons and restaurants, was caused by an electric short circuit in one of the buildings. About 60 traders were affected. He said investigations are underway to establish whether the inferno was deliberate or accidental. This is not the first time fire guts Elegu market. In January 2018, more than 200 structures were burnt down displacing about 400 people after fire gutted western part of Elegu Market in Elegu Zone II parish. In May 2017, more than 10 shops were burnt down after fire engulfed a wood workshop. In February 2017, a devastating fire destroyed over 300 temporary structures comprising of residential, restaurants and shops, displacing about 500 people. Mr Okema said despite presence of a fire department that was opened up at Elegu Police Station due to the continuous fire outbreaks, the equipment provided are too small for large fire incidences. Elegu Market, which is located a few meters away from the South Sudan border town of Nimule, attracts several traders from within Uganda and the neighboring the East African Countries.